Burn almost videos to CD,burn videos to DVD, DVD menu. Any Video Converter Ultimate is a smart tool specially designed for users which features the functions as video recording, video converting, DVD converting, online video downloading, video editing, video to DVD burning and etc. With Any Video Converter Ultimate, you can convert videos and DVD movies to videos playable on portable media players like iPod, iPhone, Zune, Zune HD, PSP, PS3, xBox 360, Archos, Sansa View, iRiver PMP, Wii, PDA, Creative Zen, and mobile phones such as Sumsung Galaxy, Nokia N-series, Blackberry and Google Nexus One. Moreover, with Any Video Converter Ultimate, you can also burn video to DVD or AVCHD DVD disc with DVD menu. It supports burning video to CD-R, CD-RW, DVD-RAM, DVD+R, DVD+RW, DVD+R Dual Layer, DVD-R, DVD-RW, DVD-R Dual Layer, random access writes. Here the following is a brief guide on how to burn video to DVD. If you want to burn video to AVCHD DVD, please refer to this guide on how to burn video to AVCHD DVD. For users who running Mac system, the current version of Any Video Converter Ultimate for Mac also could burn your videos into DVD. Besides create DVD, Any Video Converter Ultimate for Mac is also a professional Video Converter, Video Editor, Video Downloader, DVD Converter, Screen Recorder, and iPod Manager. Note: If you want to burn video to AVCHD DVD, please refer to this guide on how to burn video to AVCHD DVD. Step 3 : Choose DVD Menu. You will be prompted to choose DVD Menu before start burning. Step 4 : Click "Burn Now!" button to start encoding videos and burn videos to dvd. Once everything is ready, you can click on Burn Now ! to start the exporting process. If you would like to pause encoding, please just click the button. If you would like to stop encoding, please just click the button. 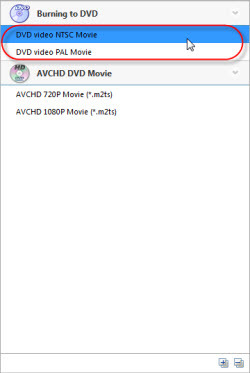 During the process of burning, you can view DVD Size, Burn Time, Burn Status at the bottom of window. 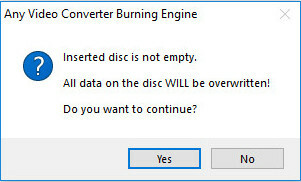 After the program finish to burn video to dvd, it will pop up a Burning Engine to congratulate you that your disc has been successfully burned. Now your video have been burned successfully to CD/DVD, just have fun! If you want to enjoy the DVD or Blu-ray DVD on your local computer, please try this Free DVD Player as well as Free Blu-ray DVD Player !